Lightweight wheelchairs are by far the most common wheelchairs in use today. They are relatively inexpensive and offer a wide range of options and configurations to make the user as comfortable as possible and the chair functional for independent mobility with the minimum of effort by the user. While all these options and configuration choices allow the user to optimise the wheelchair for their use the task of wading through all the choices when purchasing a wheelchair can be daunting but most manufacturer and dealer order forms are set up to work through each component in an organized manor that will simplify things. They are designed for users who are going to be using the chair daily for most of their mobility needs and spend many hours a day in the wheelchair. Seat widths for lightweight wheelchairs will normally be 16", 18" or 20" wide but some models will offer odd sizes such as 15", 17" and 19" and a couple offer children's sizes like 12", 13" and 14" seat widths. Seat depths are usually 16" and 18" for lightweight wheelchairs but some models will go to 20" and models designed to accommodate children can be ordered as short as 12". Odd sizes for seat depth are also available on some models. Seat height is another area on lightweight wheelchairs that can be specified. Most adult wheelchairs have a seat height before adding a cushion of 17" to 19" but can range in lightweight chairs from 13" to 21". When specifying the seat height on a new wheelchair it is important to know the thickness of the cushion that will be used and deducted from the desired finished seat height. Lightweight wheelchairs are usually made out of aluminum to reduce weight and will fold from side to side for easy storage and transporting. Because they are of lighter construction they also have lower weight capacities in the neighbourhood of 250 lbs. The overall weight of a lightweight wheelchair will be between 25 lbs. and 32 lbs. according to the manufacturers. Unfortunately there is no standard for reporting the weight of a wheelchair and different manufacturers will weigh their products with different options attached. They may, or may not, include the weight of the arms or footrests or other components. The rear wheels on this category of wheelchair are normally available in 20", 22" or 24" and have either air filled or solid tires. The front casters on lightweight wheelchairs can be any size from 4" to 8" with the most common being 6" or 8". The 6" and 8" sizes are the only ones where air filled tires are options in most cases however I don't recommend air filled tires on casters as they tend to go soft very quickly making the wheelchair hard to propel. All lightweight wheelchairs will have brakes mounted near the front of the side frame which press on the tires to prevent the wheelchair from rolling. Brakes on a wheelchair are not designed to work like a car or bicycle, they are only used to "park" the wheelchair and not used to slow it down when moving. When purchasing this category of wheelchair the user will have a choice of brakes which lock when either pushed forward or pulled back. An option for these brakes is brakes extensions which make the brakes easier to reach and give the user more leverage to ease use. Another option for this category of wheelchair is hill holders, also known as grade aids, which push against the wheels of the wheelchair and prevent them from rolling backward while allowing them to roll forward when climbing slopes. Armrests on lightweight wheelchairs are usually removable and may, or may not, flip back out of the way for transfers and approaching tables and desks. Another option for the arms is the length. Generally, wheelchair arms come in either full length or desk length. The full length arms are often an aid to people who use the arms for support when transferring while the desk length allow the chair to positioned close to a table without having to remove or flip them out of the way. Another consideration is the arm height. The standard arms will be 9" or 10" above the seat rails but once a cushion is added the effective height will be 7" to 8" and too short for most people. If the arms are too short the shoulders will slump and the user will slouch making sitting in the chair uncomfortable fairly quickly so manufacturers came up with height adjustable arms which are the best choice for most people. Lightweight wheelchairs will have a few options for footrests. They normally come in 70° and 60° angles for adults and chairs that are sized for children will also have the option of 90°. The less the leg length or the higher one wants their feet from the ground the lower the angle should be. Steeper angles (70° and 90°) will also limit caster sizes in most wheelchairs to the smaller sizes. 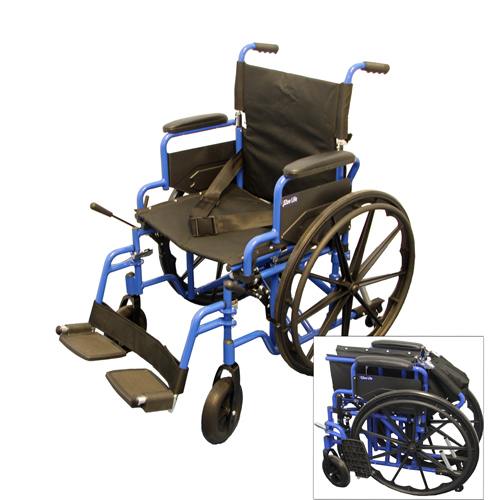 There are a couple of footplate options on the lightweight wheelchairs. The user usually has the choice of standard composite (a plastic like material) or aluminum footplates. There are also footplates that are angle adjustable for people who aren't comfortable with having their feet flat on the standard footplates. Elevating legrests are also available for lightweight wheelchairs and can have standard or angle adjustable footplates as well.